KCRC maintenance crews work hard to keep county and state roads drivable through the changing conditions of Michigan winters. The intensity, timing and duration of each winter event is different and response is adapted to address variables including type of precipitation, air and pavement temperature, traffic, wind, and time of day. KCRC crews remove snow and ice from roadways as efficiently as possible while working to keep roads open and essential traffic moving. The aim of KCRC’s storm response is to return road surfaces to normal winter conditions as soon as is feasible, targeting one pass on all roads within 36 hours of the conclusion of the event. With proper use of storm forecasts, personnel, equipment, and materials, the desired result can usually be attained. However, flexibility is needed to adapt to the variety of circumstances and possible change in weather conditions. Please note that if the snow continues to fall or drift, KCRC may have to return to the state highways and primary roads before plowing local roads and streets. KCRC targets one pass on all county roads within 36 hours of the conclusion of a storm. KCRC does NOT respond to special requests, except through law enforcement and fire services. Residents experiencing an emergency situation should call 911. KCRC will respond as directed by law enforcement. As a “necessary evil” of winter maintenance operations, snow will be deposited onto driveways during snow removal. KCRC drivers cannot lift their plows at driveways; doing so would cause the snow to be left on the roadway. Residents are asked to pile the snow on the right-hand side (when facing road) of the driveway. AVOID THE SECOND SHOVEL: This video from the Missouri Department of Transportation (MoDOT) describes the technique that will help keep your driveway clear when plows pass. It is illegal for residents or commercial snow plow drivers to push snow into or across the roadway. It is illegal for a resident or commercial snow plow driver to deposit snow, ice or slush on the roadway or shoulder of the roadway in a manner that obstructs the safety vision of the driver of a motor vehicle. KCRC does not clear sidewalks or non-motorized paths. Mailboxes must comply with regulations outlined by the United States Postal Service and residents are responsible for snow removal around their mailbox. Mailboxes set back from the edge of the road will require the property owner to remove accumulated ice/snow to allow for mail delivery. Residents are encouraged to take advantage of mild conditions and Shake Your Mailbox. Give the mailbox an aggressive shake; if the mailbox moves, it most likely needs maintenance to withstand the winter season and storm response efforts. KCRC investigates each complaint regarding a mailbox damaged during snow removal. If an inspection shows that the mailbox was hit by a plow or other KCRC equipment, KCRC will replace the mailbox. However, if damage was caused by thrown ice or snow coming off of the plow, mailbox repair is the responsibility of the property owner. Residents are encouraged to make temporary repairs to damaged mailboxes, and KCRC will make repairs, if applicable, after all storm clean-up is complete. Residents who experience mailbox damage are asked to contact KCRC by phone or complete an online form. Despite best efforts, sod along the edge of the road occasionally may be damaged during snow removal activities. In general, KCRC will repair sod damaged by a snow plow or truck. Residents who experience sod damage are asked to contact the Road Commission by phone or complete an online form. Driveway markers staked along the curb line help protect sod from damage. Markers must be flexible with reflectors so that they can be seen in the dark. It is also recommended that the markers be inexpensive; if snow banks need to be pushed back, the markers may be damaged. Damaged markers will not be replaced or reimbursed by KCRC. Please note: the placement of markers will not reduce or restrict the amount of snow being placed alongside the road. KCRC is not responsible for damage to sprinkler systems that are in the road’s right of way. Can I push the snow from my driveway onto the road? Under Michigan law (section 257.677(a) of the Michigan Vehicle Code), it is ILLEGAL to shovel or plow snow or ice onto any road or highway and the illegal practice is subject to enforcement by local authorities (police or sheriff's department). From a safety perspective, the practice of depositing snow and ice from one's driveway onto the public road can create a dangerous hazard for motorists who may slide or lose control after hitting the unanticipated snow pile along their route. I have an emergency; how do I get my road cleared immediately? KCRC does not respond to special requests except through law enforcement and fire services. Residents experiencing an emergency situation should call 911. KCRC will respond as directed by law enforcement. How does KCRC respond to a winter storm? KCRC strives to complete winter operations across its network within 36 hours following the end of a snow storm. 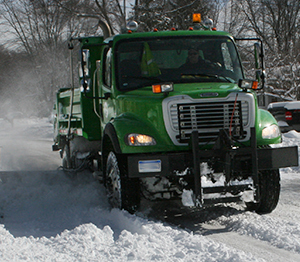 Our fleet is deployed to cover snowplow routes equating to over 5,300 lane miles of road. Day crews maintain all of the county and state snowplow routes, while evening crews maintain the snowplow routes with the highest volume/speeds – these include all state roads and county roads with the highest volumes/speeds. Please note that KCRC does NOT plow streets that are under the jurisdiction of the cities and villages of Kent County, including cities of Grand Rapids, East Grand Rapids, Cedar Springs, Grandville, Kentwood, Lowell, Rockford, Walker, and Wyoming, and the villages of Caledonia, Casnovia, Kent City, Sand Lake and Sparta. Why hasn’t my street been plowed? If snow continues to fall, KCRC may have to return to the state highways and primary roads before plowing local roads and streets. After those roads are passable, crews move on to clear local paved roads throughout the county. I’ve seen snowplows driving along during a storm with their plows raised. Why aren’t they plowing? Plows may be in operation to spread materials, or may be out of materials to spread and headed back to the garage to reload. The snowplow driver does not have the responsibility for the road he/she is currently on, and is heading elsewhere. Plow routes are designed to minimize travel in between service areas. The road may have been treated with salt or de-icing products and plowing it may remove the mixture before it has an opportunity to work. Is it legal to pass a snowplow? There are no state laws that prohibit passing a snowplow. However, the action can be extremely dangerous. Snowplows may be equipped with wing plow blades that can extend anywhere between 2 and 10 feet beyond the width of the truck. This wing plow blade can weigh as much as a compact car and is often not seen because of the snow cloud being kicked up by the snowplow. Vehicles should NEVER pass a plow truck on the right and maintain at least 200 feet distance from a moving snowplow engaged in snow or ice removal. Why can’t KCRC plows avoid pushing snow into my driveway? KCRC drivers work as efficiently as possible to cover 114 snowplow routes and treat and clear 3,000 miles of roads. Lifting the plow’s blade at every driveway would increase the time it takes to move through the designated snow routes, greatly reducing the miles of roadway crews cover during a snow or ice event. In addition, lifting the plow’s blade increases the amount of snow left on the road. Schools should have priority. Why haven’t you plowed in front of my child’s school? There are well over 300 schools in Kent County serving more than 120,000 students. Before families and buses can arrive on the school’s street, they must successfully navigate a route to get there. That is why our first priority must be to service the county’s main arteries – the state trunklines and primary roads –so that routes towards these destinations are safe to travel. What is KCRC’s policy for mailbox damage? KCRC investigates each complaint regarding a mailbox damaged during snow removal. If an inspection shows that the mailbox was hit by a plow or other KCRC equipment, KCRC will replace the mailbox. However, if damage was caused by thrown ice or snow coming off of the plow, mailbox repair is the responsibility of the property owner. Click the following for KCRC Mailbox Policy or to Report Mailbox Damage. Sod on my property was damaged by a snow plow, what do I do? Despite best efforts, sod along the edge of the road occasionally may be damaged during snow removal activities. In general, KCRC will repair sod damaged by a snow plow or truck. Residents who experience sod damage are asked to contact the Road Commission by phone or email the Road Commission via Report an Issue. Why is road salt used? Road salt is spread over roads to lower the freezing point of snow and ice; this keeps the snow “slushy” so it can be removed from the road. Before it is applied to the road, the salt is prewetted with a liquid chloride solution. This lowers the melting point and reduces the likelihood of the salt bouncing from the road surface. What are the limitations of road salt? The effectiveness of salt is dependent upon pavement temperature of 15-20°F and above. When the pavement temperature drops below 15°F, the effectiveness of salt is decreased significantly, and KCRC will begin adding other chemicals such as calcium chloride or magnesium chloride to the salt to lower the melting point. Wind conditions also play a role when deciding how to apply salt or other de-icing agents. As temperatures drop and the snow becomes dryer, wind can blow snow across the pavement. If there is a chemical residue left on the pavement from a previous salt application, blowing snow can be attracted to the residue and stick to the pavement. This creates hazardous conditions that would not have existed if no de-icing agents were previously applied. The effectiveness of salt can also be affected by the type of pavement; salt works better on blacktop pavements than on textured, concrete pavements. Why can’t salt be put on roads and bridges before it snows? Putting salt on road surfaces prior to a snowfall is ineffective because the salt often bounces off, or is blown from, the dry road before it can do its job. Salt is most effective after snow has accumulated and the temperature is 20° Fahrenheit or higher. Under these conditions, the salt mixes with the snow and melts the snow into slush that can be plowed off the pavement. Why is salt spread on a cleared highway after a storm is over? The projected temperature of the road surface will impact the final treatment of a road. If plowing operations have finished and a road is left in a "black and wet" condition, there is sometimes a danger of the water on the road refreezing. There are times, especially at night, when this post storm salt application may be necessary. Why do workers spray liquid onto the roadways before a big storm arrives? Crews will spray an anti-icing agent on areas like hills, curves and bridges prior to a storm to thwart snow from sticking to the road and minimize frost or black ice. Does KCRC remove dead animals from the road or side of the road? Crews will remove large dead animals, like deer, from KCRC’s right-of-way. We will also remove smaller animals, like raccoons, from the drivable portion of the roadway. Our crews will make an effort to contact the owner of a domestic dead animal if identification can be determined. Please note that KCRC does NOT remove dead animals from yards/areas outside the right-of-way. To report a dead animal, contact KCRC via Report an Issue or call KCRC at 616-242-6950. Why do plows push the snow off the road onto the shoulder, only to return to the same road? KCRC usually makes one pass to open the road up so that residents may get in and out. Snowplows then return to widen the road and shoulders for future snow accumulation. Why do bridges and overpasses freeze before the surface of the road? The heat underneath the road helps keep it warm and prevents it from freezing, or icing, as quickly as the air’s temperature. But bridges have no way to trap heat, so they freeze shortly after temperatures hit the freezing point. If the air temperature falls below freezing, a bridge’s surface will fall below freezing soon after causing rain or snow to freeze and stick to the bridge surface. Why are pavement and ground temperatures important? Why not rely on air temperature? The ability of salt or other deicing agents to melt snow and ice depends on the temperature of the road - not the air, and the two temperatures can differ by as much as 20°F. My car hit a pothole and incurred damage. How do I get reimbursed? ​Potholes are an unfortunate consequence of Michigan weather, and KCRC seeks to fix potholes as soon as possible after we are notified. Under Michigan law, the Kent County Road Commission (KCRC) is not liable for any damages caused by a roadway defect unless: (1) the defect constituted an imperfection that made the roadway not reasonably safe and convenient for public travel; (2) the Road Commission had notice of the defect; and (3) the Road Commission failed to take corrective measures relating to the defect within a reasonable amount of time. This is a three-part requirement. That is to say, each one of these factors must be established for liability to exist on the part of the Road Commission. Therefore, KCRC typically does not reimburse for damage due to a pothole. If you believe that all three conditions have been met, and the pothole was on a road under Kent County Road Commission jurisdiction, please contact KCRC’s Traffic and Safety Division at 616-242-6936. How can I get KCRC to fix a pothole on my street? Complete the online “Report an Issue” form or call KCRC at 616-242-6950. What are seasonal weight and speed restrictions? Seasonal weight and speed restrictions are legal limits placed on the loads trucks may carry and the speed at which they can travel. The intent of the restrictions is to protect the integrity of the road when frost is coming out of the ground. Normal legal loads must be reduced by approximately 35% and truck vehicle speeds reduced to 35 mph. What are “All Season” roads? If a tree falls in the traveled portion of the roadway, what do I do? OR call 911, who will alert us so that it can be addressed as soon as possible. What roads and bridges are part of Kent County Road Commission’s network? KCRC maintains 1957 miles of roads and 172 bridges within the County of Kent, exclusive of those that fall under the jurisdiction of the State, cities and villages. KCRC also provides routine and winter maintenance for 436 miles of state trunklines under a multi-year contract with the Michigan Department of Transportation (MDOT).